While working on extinct volcanoes in Germany, I always wanted to see Hawaii. This dream came true in 1984 when I was on my way to study volcanoes in Antarctica when we passed through Hawaii … and I got the thrill of seeing Pu‘u ‘O ‘o erupt. Later, over a beer, I was telling my friend, Russ Harmon, how my fieldwork adventures had fulfilled a long-held dream. “So, what’s your next dream?”, he asked. 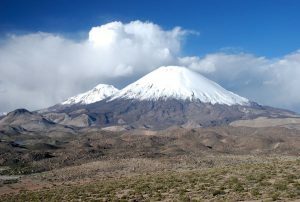 “I want to work on the volcanoes of the Atacama in South America”, was my answer, not realizing that he and his colleagues were planning a field campaign to work on Parinacota Volcano in northern Chile the next year. I was invited to join. This was 1986 and Chile’s dictator, Augusto Pinochet, was still in power. The shaggy border town of Arica, our departing spot to the high Andes, had just one lonely place to hang out before departing to the field: Café 21 on calle 21. The café was the center of town, an uneasy place where students would protest and police would arrest them, and where dollar-dealers with big pockets would be the only ones to change your currency. In the early mornings, a snarling voice offered daily newspapers telling stories of terrorist attacks against the regime and questionable weapons finds in the desert. These stories gave Pinochet all the reason he needed to violently crack down on protesters. Going into the field meant climbing a winding desert road that had the biggest potholes imaginable. We drove from sea level to 4,500 m in one day, into the winter of the Cordillera at −18 °C at night. We had to pass four police stations on the way, and each time the police recorded the numbers of all our documents into thick books. Figure 1. 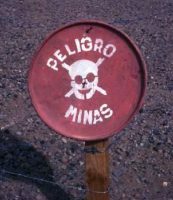 Minefield alert at a small road near the Chilean town of Ollagüe, close to the border with Bolivia. Photo: G. Wörner. Arica, and the Atacama, is a disputed border land. Land mines can be found at every road crossing between Chile, Peru, and Bolivia (Fig. 1). Chile took this territory during the “War of the Pacific” (1879–1884) in a sweeping advance to Lima (Peru). With the help of the British, Chile had fought and won this war, which was all about natural resources: nitrates, gold, copper, and other riches to fill the pockets of the wealthy and treasuries of the European empires. The Bolivians lost their access to the ocean, but they still threaten to take it back at any time. They even have a navy for that purpose, sailing on Lake Titicaca. Figure 2. Two-peso coins ‘minted’ by the nitrate mine company, Compania de Salitre de Antofagasta. These coins are made from bakelite (the first plastic made from synthetic components). These coins could only be spent in the company’s store. Photo: G. Wörner. The nitrates of the Atacama were a precious commodity, the source for the explosives that killed millions during World War I. Workers were lured into the desert mines with promises of paying off their debts, which only increased because workers had to pay for their shovels and other equipment in the company store. Regular punishments further increased worker debts. The mine company controlled the railway and even the money (Fig. 2). There was no escape from the treacherous conditions. Late in December 1907, ~18,000 mine workers, many with families, marched the >100 km from the mines in the desert to the coastal town of Iquique to protest against the difficult working conditions and low pay. Workers in the harbor, where the nitrate was shipped, joined them. The dispute ended in tragedy. Thousands were killed, and the surviving workers were forced to return to the mines. The military colonel who was responsible for this massacre was even awarded for restoring order. Those mines became ghost towns after the synthetic fixation of nitrogen from air (the Haber–Bosch process) was invented. Later, Pinochet’s torturers used the abandoned mines as prisons for those who opposed his regime. This border region of the Atacama is today crossed by many trucks that deliver and export goods to and from Bolivia. Can you imagine old, unsafe trucks overloaded with timber from the Bolivian rainforest of the Amazon basin, crossing the Andes to make their way down this treacherous road to the Pacific harbor at Arica? In 1986, this road was Bolivia’s only connection to the world’s markets. And, unfortunately, drug dealers and smugglers abound. Figure 3. Parque Nacional de Lauca (Lauca National Park) in northernmost Chile with the twin volcanoes Parinacota (front center) and Pomerape (rear). Photo: G. Wörner. But what magnificent volcanic geology! The road from Arica to the high Andes climbs along the flanks of deep canyons and arrives at vast plains covered with extensive ignimbrites. Tectonic forces have thrust the Cordillera up to 5,500 m. Incision by rivers, fed from glacial waters from peaks on the horizon, cut canyons almost 2,000 m deep. The combined tectonic and erosional processes have produced over-steepened slopes and frequent earthquakes have caused slope failures. Gigantic landslides have displaced rock sections that are more than 600 m thick up to 40 km downslope. Figure 4. 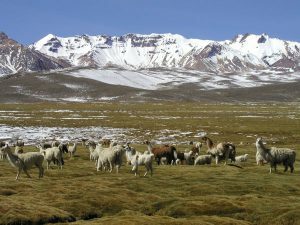 Alpacas and llamas are the economic base of Aymara Indians on the Altiplano. The animals feed on the swampy grasslands known locally as “bofedales”, which themselves receive water from higher snow melt. Photo: G. Wörner. Arriving on the Altiplano, the views are breathtaking: volcanoes right and left, snow-capped glaciated peaks rising from the Altiplano to well above 6,000 m. Parinacota is the highest volcano in Lauca National Park (Fig. 3). 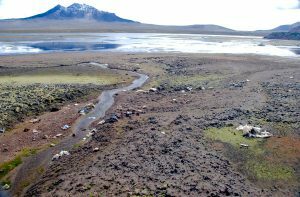 The little streams from these glaciated volcanoes feed the “bofedales”, wetlands in the desert, that are rich in green pasture for the alpacas and llamas that provide wool and meat to the Aymara Indians (Fig. 4). The elegant vicuñas and endemic (and monogamous) Andean geese live here. Coots build their nests in shallow lake waters, and giant condors circle overhead. Little jumping rabbit-like animals, with a long tail, that nurse their babies in a belly pocket, are the viscachas, marsupials similar to chinchillas. Viscachas enjoy the andesitic block lavas that provide ideal hiding spaces for rest and breeding. Their nesting material and feces are an archive for pollen, which tell stories of past climates. Wetter climate conditions during past ice ages (and even deeper in geological time) have left their traces on this land. Lake sediments and shorelines are evidence of vast lakes and changing climates on the Altiplano. The extensive salt flats (salars) are their remnants. The salars and their saline pools are home to the several species of flamingos, some endemic, that breed here. Lake Chungará, near the border of Bolivia, at 4,518 m, is the highest lake for its size (21 km2) on our planet. Lake Chungará developed after a small river was blocked by a flank collapse between growing Parinacota Volcano and Ajoya Volcano, its much older glaciated neighbor. This blockage severed the connection to the surrounding outflowing rivers Lake Chungará therefore still has its original livestock of small endemic killfish. Biologists once told me the story of these fish: the genetic code of the endemic fish indicates their origin in the salt waters of the Atlantic Ocean where their closest relatives now live. They adapted to the freshwater rivers that drained the Amazon and lived happily until tectonic forces changed and displaced the drainage systems. With the formation of the endorheic basin of the Altiplano at about 10 Ma, some rivers (and some fish, apparently) were caught up between the eastern and western cordilleras. Increasing aridity, due to blockage of rain from the east and the development of the cold Humboldt Current along the west coast, created large salars that are fed by small freshwater rivers. The killifish had to adapt and retreat to the upper reaches of these rivers where they encountered fresh glacial meltwaters, such as the small river south of Parinacota Volcano. When Parinacota’s flank failed, these fish were isolated from the rest of their native waters on the Altiplano. Since then, their genetic code has deviated from populations beyond the lake. This is a striking example of geological and biological coevolution. Figure 5. An example of the llareta (Azorella compacta) plant growing more than a meter thick. Photo: G. Wörner. This place is full of wonders. 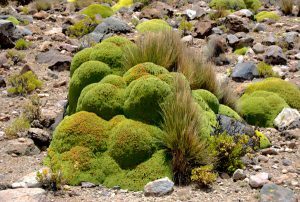 The llareta (yareta) cushion plant, for example, can grow for hundreds of years at altitudes of between 4,400 m and 4,800 m, forming bulges more than a meter high (Fig. 5). The indigenous Aymara Indians know their varied uses. Llareta extracts have antibacterial effects, its resin can be used as glue or as a fragrance, and the dried plant is the only fuel to be found at such elevations. The Lauca National Park with the old town of Parinacota at its center, and the Vicuñas National Reserve have been set up to preserve the natural wonders of the region. Plans to lower the level of the lake to feed water to an electrical power plant were abandoned and mining activities have been restricted. Consequently, many animals thrive here. In contrast, across the border in Bolivia, the viscachas and vicuñas are hunted down and eaten. Global climate change and globalization have taken their toll. Glaciers have retreated dramatically over the past 27 years that I have conducted fieldwork in the region. The level of Lake Chungará has dropped, exposing tens of meters of muddy ground along its shallow shores (Fig. 6). Climate change combined with excessive borax mining in the National Reserve has lowered the water level of Salar de Surire and now threatens the endemic Andean flamingos. Road traffic has exploded with globalization. The new tarmac road from Arica to La Paz has litter everywhere, plastic bags and bottles being tossed out by truck drivers. This arid Atacama ecosystem has not had the same level of support and the attention as that of our planet’s rain forests or Antarctic jewels. But, it is just as precious, unique, and vulnerable. It should not need a geologist’s view and almost 30 years of observation to recognize the true value and beauty of these arid lands. Working there has become my life’s true dream and it is saddening to realize that such beauty will soon be gone.